UHD professor Leigh Van Horn recently took several of her urban education students to participate in a "Family Literacy Event" at the House of Tiny Treasures, a school for homeless youth. These events are part of a research study to learn about family literacy in homeless families. 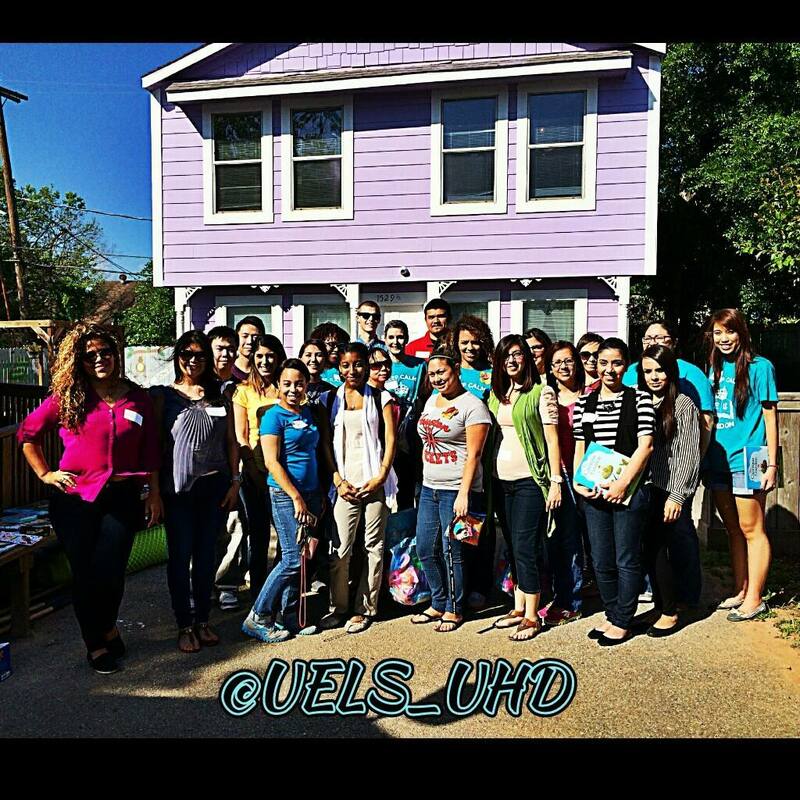 They also represent unique opportunities for teacher candidates in UHD's urban education program to gain further understanding about family literacy and implications for teaching in urban environments. During this event, participants can either facilitate an interactive read aloud for children and their parents or guide the families in a response activity following the reading. During last week's event, the group from UHD shared "The Curious Garden," a book by Caldecott winning illustrator Peter Brown. This is a "magical story about a boy's dream and how the efforts of one small person can help change the world." The story is based on the High Line, an elevated steel railway built in 1929 on the west side of Manhattan that became an aerial greenway. UHD teacher candidates facilitated an interactive read aloud, encouraging participants to look at each illustration and talk about what they see and feel. After reading and talking about the book, Van Horn and her students engaged in two parallel response activities. First, children chose various fabric flower petal cut-outs and stacked them in an order that made a fluttery "flower". Then the children went out into the House of Tiny Treasures garden and, with the help of the UHD teacher candidates, planted Texas bluebonnet wildflower seeds into the garden. While the children were doing this, their families took the stacked fabric pieces and made them into "flower" pins. The UHD teacher candidates helped parents put a pin into the fabric and then covered the face of the pin with additional fabric, thus creating a fabric corsage that can be worn. At the end of the event, each family received a copy of "The Curious Garden" and was invited to choose another book to take home as well. The children and their families were each provided with a flower seed packet, trowel, and watering can so they could find a spot in our city that is drab and make it blossom! "Family Literacy Events at the House of Tiny Treasures are truly inspiring to us as educators. We hope to reach out to families as we engage in literacy activities, and as we learn together how to communicate in a relaxed environment and share information that will help us meet the needs of the children we nurture and teach," said Van Horn.